Since it became widely commercially available in the 1960s, the treadmill has without a doubt remained one of the most popular pieces of cardiovascular equipment to ever be invented. While it may be loved and loathed the world over, there’s no denying how successful it has been at providing a comfortable way for exercisers to walk, jog and run to their heart’s content, without the need to brave the elements. Global fitness equipment sales, currently in their billions, back up just how dominating the treadmill is in the world of fitness. Recent reports have confirmed that it is in fact the single most popular of CV equipment available. From big name gyms and health clubs, to independent studios and even peoples’ garages and living rooms, treadmills are a staple of the fitness world. There are no shortages of blog posts and articles that focus on the so-called ‘dark history’ of the treadmill. These pieces are of course referring to Sir William Cubitt’s notorious 19th century invention, the penal tread-mill – something even writer Oscar Wilde had the displeasure of experiencing. While Sir William’s tread-mill laid the ground work for the machines we know and use today, the treadmill’s story actually started several centuries previous. In a new in-depth piece produced by the UK’s most popular fitness training provider, HFE, the actual ancient origins of the treadmill are revealed. Accompanied by an informative, visual timeline, their article begins with the Romans in 1st century AD who used a treadwheel, or polyspaston crane, to lift heavy objects. In fact, this device was so powerful and efficient that is was 60 times more than the solely man-powered methods used by the Ancient Egyptians. HFE’s article does of course cover the infamous prison tread-mill but also looks at alternative uses for the then fledgling technology. For example, throughout the 19th century animals were placed on treadmills and used to power machinery. Perhaps the most surprising example being horse-powered boats in the US. Naturally, the treadmill’s modern evolution is explored starting with Claude Lauraine Hagen who filed one of the earliest ever patents for a treadmill. From there development and innovation increased at a rapid pace with manually-operated treadmills appearing in the 1920s and 30s and later in the 1950s, the first motorised treadmill. This was pioneered by Dr Robert A Bruce, the Father of Exercise Cardiology. William Staub is the inventor of the first mass-produced treadmill designed for the home and his PaceMaster was used by everyone from casual exercisers to presidential candidates and it’s his design that cemented the treadmill’s modern popularity and paved the way for today’s fitness giants such as Life Fitness, Technogym, Matrix and more to fill gyms with row after row of treadmills. 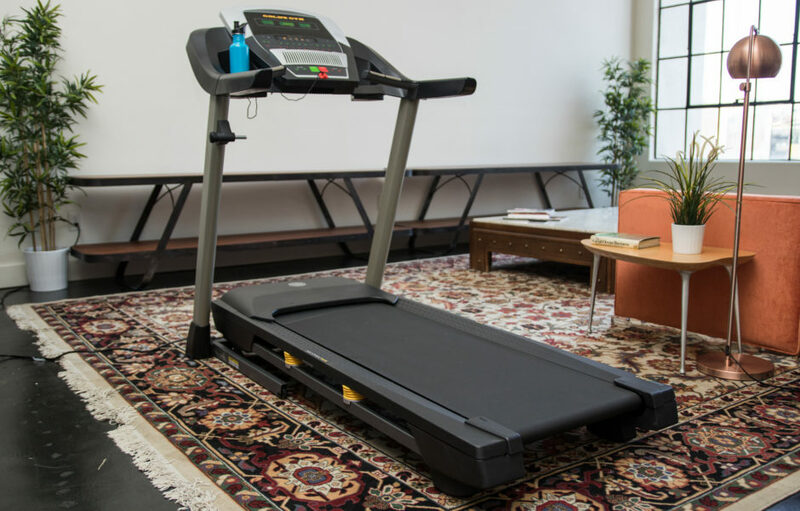 HFE’s full article can be read here and includes a completely history of the treadmill alongside a brief look to the future of treadmill technology. HFE is the UK’s most popular provider of personal trainer courses and fitness qualifications including yoga, Pilates, sports massage and exercise to music. They also run an award-winning blog featuring interviews with leading sportspeople and fitness personalities from around the world.